‘The poor will have the Gospel preached to them’ (Matt 11:6), we read in Scripture, precisely as one of the signs which mark the arrival of the Kingdom of God. Those who do not love and practice the virtue of poverty do not have Christ’s spirit. This holds true for everyone. For the hermit who retires to the desert; and for the ordinary Christian who lives among his fellow men, whether he enjoys the use of this world’s resources or is short of many of them. I would like to go into this topic at some length because when poverty is preached nowadays it is not always made clear how its message can be applied in daily life. There are some people, well-intentioned no doubt but they haven’t quite managed to move with the times, who preach a poverty which is the result of ‘armchair speculation’. This poverty has certain ostentatious outward signs while at the same time it betrays enormous interior — and also sometimes exterior — deficiencies. Recalling an expression of the prophet Isaiah — discite benefacere (Is 1:17) — I like to say that we have to learn to live every virtue and perhaps this is especially true of poverty. We have to learn to live it, otherwise it will be reduced to an ideal about which much is written but which no one seriously puts into practice. We have to make people see that poverty is an invitation which our Lord issues to each Christian, and that it is therefore a definite call that should shape every human life. Poverty is not a state of miserable want; and it has nothing to do with dirtiness. 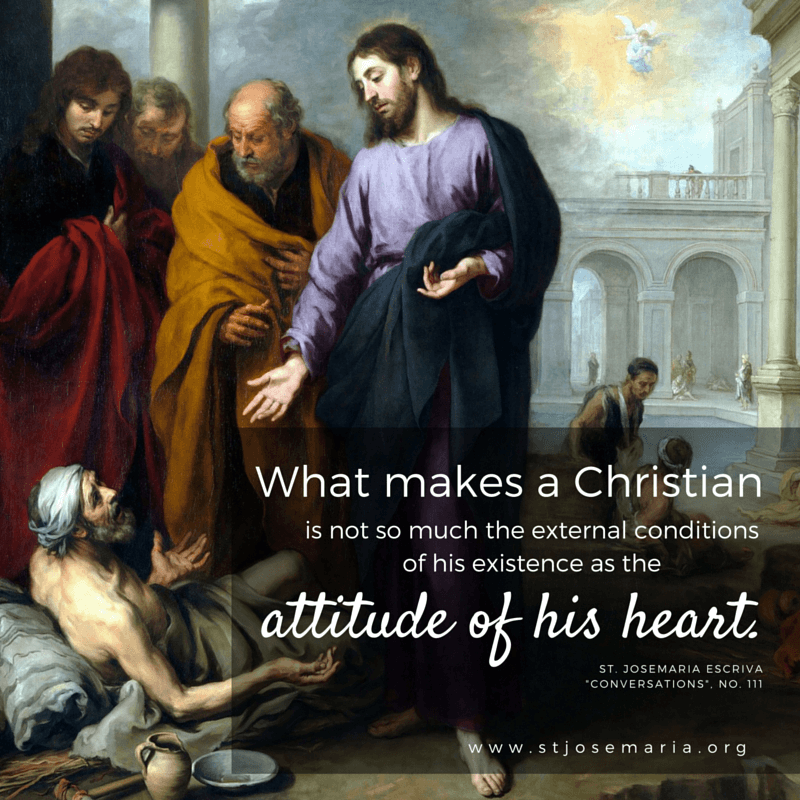 Because, to start with, what makes a Christian is not so much the external conditions of his existence as the attitude of his heart. And with this, we are getting close to a very important point, on which a correct understanding of the lay vocation depends. For poverty is not simply renunciation. In certain circumstance Christians may be asked to give up everything as a testimony to poverty. They may be asked to challenge directly a society bent on material well-being, and thus to proclaim to the four winds that nothing is good if it is preferred to God. However, is this the witness that the Church usually asks today? Isn’t it also asking us to give an explicit testimony of love for the world and of solidarity with our fellow men? Sometimes when people consider Christian poverty they take as their main point of reference the religious whose job it is to give, at all times and in all places, official and public testimony of poverty. Such considerations run the risk of not recognizing the specific characteristics of a lay testimony, lived interiorly, in the ordinary circumstances of everyday. The ordinary Christian has to reconcile two aspects in his life that may at first seem contradictory. There is on the one hand, true poverty, which is obvious and tangible and made up of definite things. 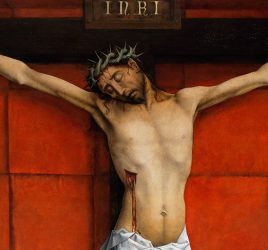 This poverty should be an expression of faith in God and a sign that the heart is not satisfied with created things and aspires to the Creator; that it wants to be filled with love of God so as to be able to give this same love to everyone. On the other hand an ordinary Christian is and wants to be one more amongst his fellow men, sharing their way of life, their joys and happiness; working with them, loving the world and all the good things that exist in it; using all created things to solve the problems of human life and to establish a spiritual and material environment which will foster personal and social development. Achieving a synthesis between these two aspects is to a great extent a personal matter. It requires interior life, which will help us assess in every circumstance what God is asking of us. For this reason I do not want to give fixed rules, although I will give some general indications with special reference to mothers of families. Poverty consists in large measure in sacrifice. It means knowing how to do without the superfluous. And we find out what is superfluous not so much by theoretical rules as by that interior voice which tells us we are being led by selfishness or undue love of comfort. On the other hand, comfort has a positive side which is not luxury nor pleasure seeking, but consists in making life agreeable for one’s own family and for others, so that everyone can serve God better. Poverty lies in being truly detached from earthly things and in cheerfully accepting shortage or discomfort if they arise. Furthermore it means having one’s whole day taken up with a flexible schedule in which, besides the daily norms of piety, an important place should be given to rest, which we all need, to family get-togethers, to reading and to time set aside for an artistic or literary hobby or any other worthwhile pastime. We live poverty by filling the hours of the day usefully, doing everything as well as we can, and living little details of order, punctuality, and good humor. In a word, it means finding opportunities for serving others and finding time for oneself without forgetting that all men, all women — not only those who are poor in a material sense — have an obligation to work. Wealth and abundance of economic means only increase one’s obligation to feel responsible for the whole of society. It is love that gives meaning to sacrifice. Every mother knows well what it means to sacrifice herself for her children; it is not a matter of giving them a few hours of her time, but of spending her whole life in their benefit. We must live thinking of others and using things in such a way that there will be something to offer to others. All these are dimensions of poverty which guarantee an effective detachment. It is not enough for a mother to live in this way. She should also teach her children to do so. She can do this by fostering in them faith, optimistic hope and charity; by teaching them not to be selfish and to spend some of their time generously in the service of other less fortunate people, doing jobs suited to their age, in which they can show in a practical way, a human and supernatural concern for their fellow men. To sum up: each person has to go through life fulfilling his vocation. To my way of thinking, the best examples of poverty are those mothers and fathers of large and poor families who spend their lives for their children and who with their effort and constancy — often without complaining of their needs — bring up their family, creating a cheerful home in which everyone learns to love, to serve and to work. St. Josemaria Escriva, priest and founder of Opus Dei, was canonized by Pope John Paul II in 2002 and declared the “saint of the ordinary” for his example and teachings on the value of work and daily life as the path to holiness in the middle of the world.